There was mixed luck for Kerry Hurlers at Dr Hyde Park this afternoon where the Minor Hurlers failed in their quest for 6 All Ireland Minor B Titles in a row, but the Under 21 Hurlers advanced to the semi finals of the Under 21 B (Ritchie McElligott Cup) with a big win over Donegal. A strong finish when wind assisted in the second half secured Kildare victory in the opening game. Despite playing with the fresh wind, Kerry were on level terms at the end of the first quarter on 4 points apiece but they did go on to lead by 9 points to 6 at the break. On the restart Kerry went six points clear following a goal from Philip Maunsell and missed a number of scoring chances from frees to add to that lead. Kildare goaled at the right time and approaching the final few minutes scores were level on a couple of occasions before Kildare got two late points against a Kerry side who gave it their all throughout. Kerry eased their way into the semi final of the Under 21 B Championship (Ritchie McElligott Cup)with a comprehensive victory over Under 21 “C” winners Donegal in the second game in Hyde Park. Kerry led by 0-12 to 0-4 at the interval despite playing against the wind and went on to better that total by two when scoring 14 points when wind assisted in the second half to set up a semi final meeting with Meath on Saturday at a neutral venue to be decided. Meath defeated Mayo by 2-19 to 0-11 in the other semi final. 3 teams have now qualified for the semi-finals of the 2017 Garvey’s SuperValu Kerry senior hurling championship. In last weekend’s action, Ballyduff had a dramatic 1 – 10 to 0 – 12 win over Causeway while St. Brendan’s and Abbeydorney will have to meet again after their 1 – 12 all draw. Ballyduff join Round 2A winners Kilmoyley and Lixnaw in the last four. Saturday 26th August has been fixed as the date for the St Brendans V Abbeydorney replay in Austin Stack Park and that game will form a double bill with the Credit Union Senior Hurling League Final between Ballyduff and Kilmoyley. Kilmoyley and Lixnaw will be seeded in the semi final draw which is due to take place later this week but there are no other stipulations or criteria attached to the draw so, for instance, teams who met previously in the competition could end up playing each other again at the semi final stage. 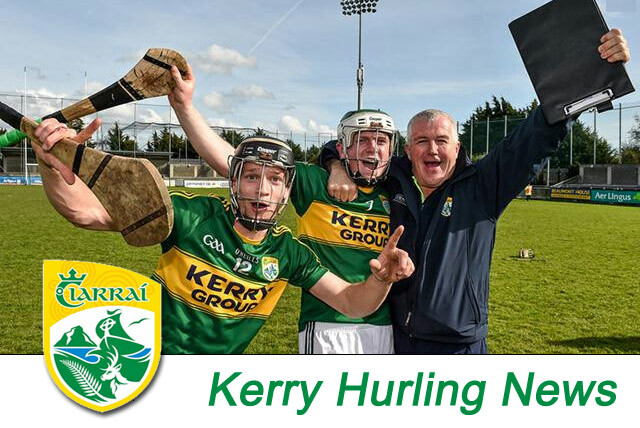 The dates for the semi finals have been fixed for September 10th but that is a provisional date at the moment while Kerry’s progress in the Under 21 Hurling championship is ongoing. A dramatic finish saw St. Brendan’s and Abbeydorney finish all square at Austin Stack Park on Saturday. The Ardfert side was up 5 points, 1 – 12 to 0 – 10 after 58 minutes and looked likely to progress. However a storming finish by Abbeydorney yielded 1 – 2 without reply and sent the tie to a replay. All this additional scoring happened during the 9 minutes of additional time called by referee, Dermot Kirwan. This was mainly due to an injury to a St. Brendan’s player mid-way through the half which resulted in a long stoppage to play. Firstly a Nigel Roche free reduced the deficit to 4 points in the 61st minute. Then a long ball into the square was finished to the net by David Egan in the 64th minute to leave just a point between the sides. The St. Brendan’s goalkeeper, Darren Delaney, got injured during this play but he was treated and managed to stay on the field. Abbeydorney won the next puck out and Roche obliged to send the ball between the posts for the equaliser in the 66th minute. Tim Hannafin then took over between the posts for the Ardfert side and his puck out was strongly contested out field, at which stage the full time whistle went, to the relief of all present. These last few minutes redeemed what was a rather pedestrian affair throughout. Scores were level three times during the first half, after which the teams were locked together at 4 points apiece. They were level again in the 41st and 45th minutes before St. Brendan’s, with a Tim Hannafin goal and a Kevin Skinner point, put them up 4 with 9 minutes remaining. Substitute Padraig O’Mahony made it 5 up on 58 minutes and they looked well on their way. However the never say die attitude of Abbeydorney came to the fore and they deservedly managed to get a replay. St. Brendan’s: John Egan (0 – 4, 3f), Tim Hannafin (1 - 0), Kevin Skinner (0 – 2), Tom Moloney (0 – 1), Eric Leen (0 -1), David Griffin (0 – 1), Kevin Hannafin (0 – 1), Padraig O’Mahony (0 – 1), Cian Hussey (0 - 1). Abbeydorney: Nigel Roche (0 – 10, 9f), Aidan Healy (0 – 1), P.J. Keane (0 – 1). Another dramatic finish at Austin Stack Park on Sunday when a 60th minute goal from Gary O’Brien for Ballyduff gave his side a 1 point victory and a place in the semi-final of the 2017 Garvey’s SuperValu Kerry Co. Senior Hurling Championship. Prior to that score Ballyduff were 2 points down, had been reduced to 14 men following a straight red card to Mikey Boyle and they looked on the way out of the competition. However their never say die attitude saw them keep contesting strongly and this was rewarded at the finish. Overall the game was played in poor conditions, with some heavy showers throughout, yet both teams gave everything in the quest for victory. The first half saw the teams level on three occasions, in the 7th, 22nd and 26th minutes before a ’65 from Padraig Boyle gave Ballyduff a 0 – 7 to 0 – 6 lead at the interval. Boyle added another pointed free on the resumption to give his side a 2 point lead. Causeway scored the next five points without reply to put them 0 - 11 to 0 – 8 ahead by the 48th minute and they were playing some superb hurling. However, Causeway will rue the many chances they missed, shooting 10 second half wides. Padraig Boyle narrowed the gap with 2 pointed frees in the 50th and 58th to leave it 0 - 11 to 0 - 10. Billy Lyons restored Causeway’s 2 point advantage with a 59th minute point as the Causeway supporters sensed victory. Then came that late goal which allowed Causeway little time to respond and send Ballyduff into the semi-final. Ballyduff: Padraig Boyle (0 – 5), Gary O’Brien (1 - 1), Eoin Ross (0 – 1), Aidan Boyle (0 -1), Liam Boyle (0 – 1), Paul O’Carroll (0 - 1). Causeway: Keith Carmody (0 – 6), Billy Lyons (0 – 3), Colum Harty (0 – 2), Tommy Casey (0 – 1). Round 3 of the 2017 Garvey’s SuperValu Kerry senior hurling championship will be played in Austin Stack Park on this weekend. On Saturday evening, 5th August, St. Brendan’s play Abbeydorney at 7.00p.m. while on Sunday at 2.00p.m. Ballyduff take on Causeway. If any of these games finish level they will go to a replay. The winners of each will join Lixnaw and Kilmoyley in the semi-finals, scheduled for the weekend of 26 August. Last weekend Kilmoyley defeated neighbours St Brendans by 0-19 to 0-14 in Round 2A to claim a semi final place while in Round 2B Causeway defeated Crotta O’Neills by 2-18 to 0-12 to go forward to Round 3 with Crotta exiting the championship. The semi finals are due to be played on the weekend of August 26th and the final is fixed for September 10th.